As with most languages, there are some differences in how Chinese is spoken versus how it is written. When speaking Chinese, it is normal and expected that wordless sounds will be added to the end of some sentences. These sounds add connotation to the communication, either emphasizing or softening what is being said. I wrote previously about some sound endings that are more like punctuation, because they inform the listener more exactly about the meaning of the sentence, whether it is a suggestion, a command, or an inquiry. The sounds I am referring to today are more along the lines of indicating the mood of the speaker or his feelings about what is going on. These sounds are usually only added to beginning or end of brief sentences. You will notice that all of these sound characters begin with the radical for “mouth,” which is 口(kou3). That is one way to help recognize them in written dialogue. The tones are almost all listed as “first tone” in my dictionary, but when my tutor is saying them, they come across as a bit more sing-song. She says they are often spoken in the shorter neutral tone, too. 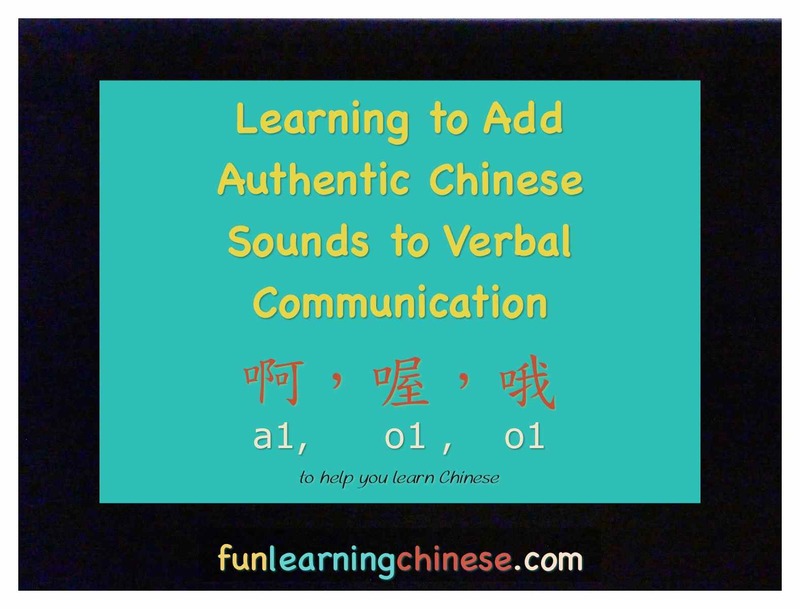 They frequently have slight variations in pronunciation that are not clarified by the pinyin spelling. She tells me that the sounds can vary according to individual habits or regional accents. Should we eat pizza for dinner? Doesn’t that sound good? Any of the first three sound words can be used to make the sentence seem less abrupt, and thus spoken on more friendly and light-hearted terms. However, any sound might be used, depending on a speaker’s habits or preference at the moment. Are you hungry? I am very hungry! I am really out of luck! In the second example just given, the sound word would be left off if the speaker felt care was truly needed immediately. Leaving off the sound would make it more succinct and attention grabbing. In fact, the beginning of the sentence would probably be left off, too. When my tutor said the sound, 哦 (o1), is used very interchangeably with the other “o” sound 喔, but had a slight “w” sound at the beginning. It may be helpful to note that all of these sounds are made with minor adjustments to the inside of the mouth and palate, and little or no movement of the lips. Are you thirsty? I am very thirsty! (You) must not forget? or Don’t forget! Oh! I almost forgot, thank you for reminding me. (Please) you must not be angry! or Don’t be mad! The character 嗨 (hai.) is considered to be a sound word because, even though it is a “loan word” from English, it does not have a specific meaning, other than being a sound made when greeting someone. Many of the sounds words are sounds that seem to have counter parts in any language. For instance, 哇 (wa.) is used in Chinese much like “wow” is used in English. Wow, your daughters are so pretty! You can see that in the above sentence, sounds are at the beginning and end of the sentence. Sound words are not used often when speaking scornfully. They also don’t tend to be used if emphasis is already in the sentence, such as when 這個 (zhe4 ge.) “this” or 那個 (na4 ge.) “that” are part of it. He is a stupid egg. Again, it is important to know that these are sounds of informal or colloquial spoken language. Of course, these sound characters will be written in cases where an accurate verbal representation is desired, such as dialogue in a story. It has felt awkward to me to try to use these sound words. Partly, I just needed to break the ice of doing something that didn’t come naturally. Partly, I don’t always know when it is best to use them. 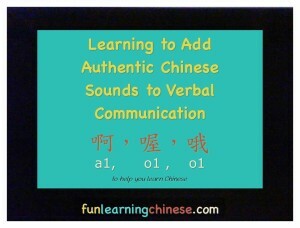 For example, when I tried, my tutor corrected me to using the more familiar (to me) 了 (le.) a few times.